Turn Your Kids Into Cash! Greetings potential parentals. If you’ve got a baby on the way but are a little worried that it’s not your nature to nurture, maybe you should stop asking yourself the question, “how do I take care of my baby?” and start asking, “How can my baby take care of me?” Put down that volume of Dr. Spock and make sure your new son or daughter is ready to rock with the latest friendly trend of turning your kids into cash! Now we here at the Trendliest aren’t condoning selling your newborns onto the black market (just yet). We’re merely suggesting that you start preparing your child for a successful career early on so they can literally and figuratively stop sucking at your teat before they ever start while chipping in a little towards your monthly rent or mortgage payment that their birth has helped make more difficult to pay. First off, the road to success starts in the womb and certainly is paved with both placenta and gold. While your child is developing, don’t underestimate the importance of music. Play as much meaningless pop as you can so when your child finally pops out he or she will be influenced by the songs of relatively young idols like Britney Spears and Avril Lavigne, appearing at an early age to want to follow their career path. Once your child is old enough to hum or sing, invoke the Lynne Spears Method of Parenting as laid out in her book, Through The Storm: A Real Story of Fame and Family in a Tabloid World. Goodbye Dr. Spock, Hello Lynne! The most important part of this method is never saying no to your child. If you’ve done your job correctly so far, your son/daughter will want to be a singer. Cater to all their performance whims and make sure to constantly encourage them in their performance field. Be sure to purchase a big stereo with a karaoke feature and a top of the line microphone so that they might practice at home for all of their big auditions, it’ll pay for itself. Tell your child they have the most beautiful voice in the world and that they should take singing and dancing lessons and go on auditions so mommy and daddy won’t be poor no more. As for education, School is a formality when you’re getting your degree in Showbiz. No matter how unready your child may be, ignoring education will put a fast track to success and a slightly slower track to the mental ward or rehab, but the latter two results are just minor obstacles to maintaining a fabulous career. If you’ve not succeeded in Ms. Spears method your child might want to be an NFL Place kicker, a fireman or Chief of Police, in which case you should probably start practicing kickoffs, taking your child to the firehouse to practice drills, or just having a gun in the house to hone those respective skills. After all catering to your childs first whim and encouraging them to be whatever they want to be as long as it has the potential to earn you cash is the trendliest way to parent. Hey trend surfers, it’s your friendly neighborhood trend-vel agent here to tell you about some of the hottest spots to get your leisure on this summer. A few years ago all of the richies were heading to tony locations like the French Riviera and Rockaway Beach to get their fix of that fishy sea smell, cool ocean breeze, and to reap the benefits of the epidermal enhancements that come with getting crapped on by a seagull. However, with the economy in a slight temporary downturn, celebrities like P. Diddy and Fred Schneider of the B-52’s have ditched those pricey locales in favor of the less lavish but ultimately more rewarding experience offered at water parks. So why is everybody rushing off to their local wild water wet spots instead of hitting the sandy seashores? Two trendly words….Wave Pools. Originally invented to bring the magic of the high seas and the joy of almost drowning to land locked areas like Nebraska and Hawaii, as well as to teach potential Cuban refugees how to survive the short trip to Miami; wave pools are an effective way to simulate your day at the beach without worrying about getting sand in your crack or falling victim to a vicious dolphin attack. Swim enthusiasts don’t even have to worry about easing into chilly water beyond their precious privates, because these faux-ceans (that’s fake oceans) are heated; if not by a big fancy pool heater, by the constant stream of urine being emptied into the water by scores of unconcerned children and incontinent adults. Wave warriors can even take their long boards out and hang ten in the pool pipeline, provided they’re skilled at evading toddlers. The best part is, there’s no need to check the daily surf report because, get this, the waves are adjustable! 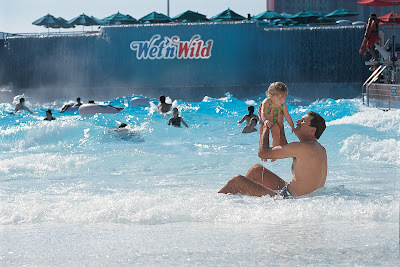 So whether you’re just a beginner in the blue crush or you’re ready to tackle a tsunami, the wave pool is the trendliest place to get wet this summer.